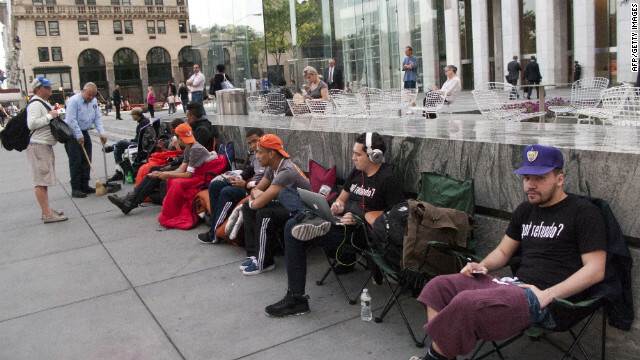 New Yorkers camped out for days to get the iPhone 5. (CNN) - The mobile technology evolution has hit a fever pitch in recent years. It seems every few months, consumers have new or upgraded devices to consider in the marketplace. In just the last couple of weeks, Apple and Amazon have unveiled their newest and improved gadgets. [:35] "I normally replace every year. I have to. Everything. Sometimes twice a year on the phones." For Fulton, that means updating his Android phone, along with a tablet and two laptop computers. Tech companies love people like Fulton who must have the latest gadgets as soon as they come out. Increasingly though, people who usually sit on the sidelines when new devices are released are finding them harder to resist. Technology's rapid advance, and its saturation of our lives, is changing how we view the devices and when we buy them. [5:44] "People need this almost to survive. People talk the same way about cable television, where this has become a fundamental need of functioning in society. In a way where people used to talk about food and access to clean water." From a 'need' to a 'want'. From 'what's new' to 'when to buy.' Things may never be the same for consumers and technology. "People need this almost to survive." Gross. I'm 36, don't have a cell phone and have no plans to get one. What's wrong with people? The phone upgrade doesn't even come close to the automobile upgrade that occurs EVERY year. what car manufacturer are you talking about? Most have a 5 year model life which usually includes a mid-model upgrade where they add a feature or two and maybe change the rims. But I've never heard of an auto maker redesigning every year. Cable tv is not a need. I've survived just fine without it for years. Oy Vey, Maria! Wait a few months and the iPhone 10 will be out. You'll get tweets from God and be able to converse with the dead. Not to mention the courts have screwed the playing field for microsoft. Throwing court cases at them for having their own browser on their own OS, but apple can do it without question. Maybe so, but can you download iTunes on your Android? I believe the right question is, can you download googleplay or Amazon marketplace on iPhone? Can you buy iPhone/ipad compatible apps and books from a non iTunes store if they offer better pricing? You cannot, and that is problem. You do not have a choice. In fact, on newer macs you can only buy some software via their App store. i SWEAR CNN owns Apple stock. Regardless of how petty the Apple news, CNN reports it EVERY SINGLE DAY! No other tech company gets as much attention from CNN editors as Apple. its just no one cares about other phones.. apple articles get the haters and the lovers. when an android phone comes out other then a few people on this forum. no one cares ! thats why! Apple is what every American company should be....#1 in the field in which it operates. Why wouldn't CNN post articles about this company? In the mid-1990's Apple was all but dead. Microsoft had "won" the war. It's interesting to see how things have changed. The I-Phone alone is bigger than Microsoft.